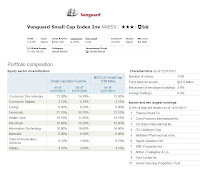 Michael H. Buek is the current lead manager of this Vanguard mutual fund. He started managing this stock fund since December 1981. This fund was first introduced to public in 1960. The total net assets of this fund are $22.94 billion. This US stock fund has a dividend yield of 1.19%. The last dividend was distributed on December 2011 ($0.12). It has 12% annual holdings turnover. Morningstar analysts rated this small blend mutual fund with Gold rating. It also has 3-star rating from Morningstar. Based on the load adjusted return, the fund has returned -2.80% over the past 1-year and 1.79% over the past 5-year. The best 1-year total return was recorded in 2003 with 45.63%. The 3-year beta is 1.28. The fund benchmark is MSCI US Small Cap 1750 Index. Investor can start investing in this best stock mutual fund with a minimum initial investment of $3,000 for brokerage or IRA account. The minimum subsequent investment is $100. The fund doesn’t apply any 12b1 fee or front-end sales load fee. There are 89 brokerages that provide this fund. They are E Trade Financial, JP Morgan, T Rowe Price, Schwab Retail, Vanguard NTF, Fidelity Retail Funds Network, Royal Alliance, etc. 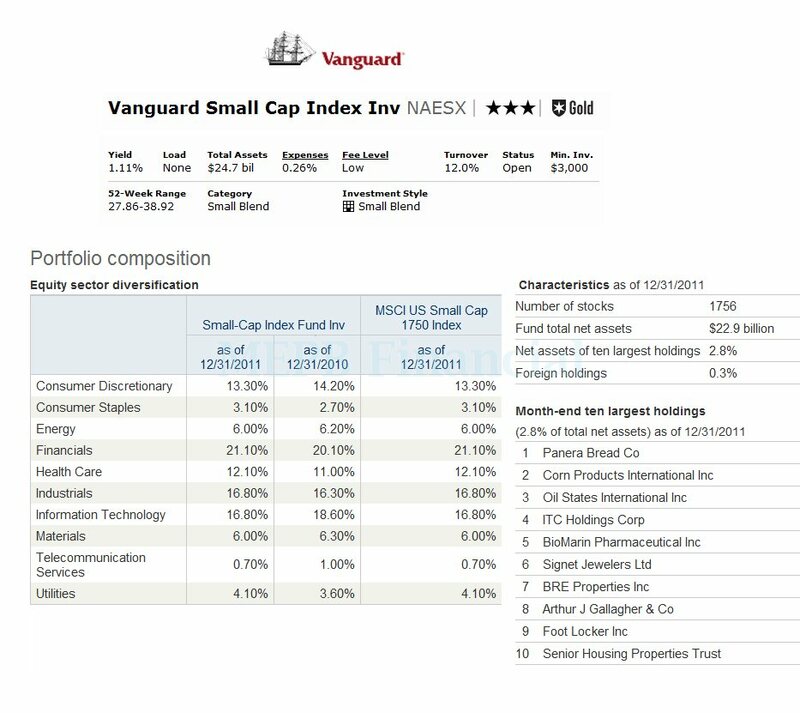 The other class of this fund is Admiral Shares (VSMAX). As of December 2011, the top 10 largest holdings of this top small cap mutual fund are Panera Bread Co, Corn Products International Inc, Oil States International Inc, ITC Holdings Corp, BioMarin Pharmaceutical Inc, Signet Jewelers Ltd, BRE Properties Inc, Arthur J Gallagher & Co, Foot Locker Inc and Senior Housing Properties Trust. These ten companies represent 2.8% of total net assets. The top equity sector diversification is Financials (21.10%), Industrials (16.80%) and Information Technology (16.80%), Consumer Discretionary (13.30%) and Health Care (12.10%). Primary investment risks are Stock market risk, Investment style risk, small cap risk, etc.